4) Wrap lead wire along centre half of the length of the hook shank and double back wrapping second layer to make a “ball” shape. The lead results in a dipping action on the retrieve. 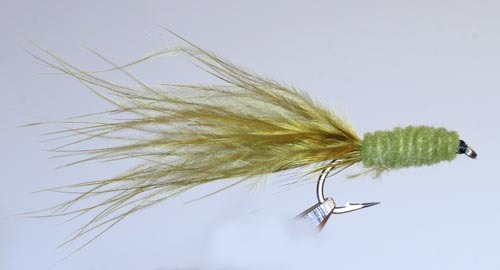 Fish this fly over weed beds, along reed banks or in shallows using figure of 8 retrieve or short erratic pulls to create a darting movement. When fish are swimming circuits in the shallows allow the fly to rest on the bottom in the path of fish and give a short tug as the fish approaches.